My daughter hadn’t even been home from college for a full day and already she expected me to feed her. Not just anything either, apparently she wanted a fancy breakfast. You know, something a little more upscale than toast. Obviously I had been remiss in teaching her just how far a nice strong cup of coffee could take her. I suppose this is my own fault. You see I’ve been telling both of my girls that “breakfast is the most important meal of the day” ever since we can remember. This is despite the fact that I’m not a big fan of breakfast. I encourage my kids to eat, but I need a few hours to nurse a cup or two of coffee to slowly wake myself up. Still, in an effort to appease my starving child, I started offering all the breakfast-y type foods I could think of. Fruit, a bagel, pancakes, cold cereal, even some tofu scramble. Nothing sounded interesting to her. I decided to take my coffee into the other room and just let her starve. A few minutes later, KT followed me into the room reading from a cookbook. (A cookbook? Who uses a cookbook when the sun is barely in the sky?) She said she had found a recipe for Cinnamon Coffee Cake. I told her that sounded wonderful. We even had cinnamon and coffee and cake…pans. KT flashed me a quick grin, told me to “c’mon,” then ran back into the kitchen. I finished the last few sips of coffee in my cup then headed toward the kitchen to make a coffee cake for KT. I was pleasantly surprised to find my amazing daughter nearly ready to pop the cake in the oven. Half an hour later, we were happily feasting on a beautiful Cinnamon Coffee Cake. Hmmm…maybe there’s something to be said to having a cheerful girl home from college, prepared to make sure we all enjoy the most important meal of the day. This entry was posted in College, Family, Food, KT and tagged baking, Breakfast, coffee cake, Cooking, daughter, winter break. Bookmark the permalink. Mmmm. 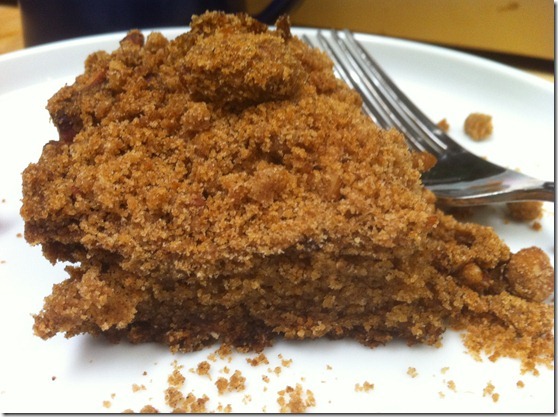 I really want coffee cake now!